Greg Mankiw's Blog: How large is the fiscal hole? How large is the fiscal hole? $9 trillion ($9.051 trillion) is the Obama Administration’s 10-year deficit projection based on their own economic forecast and their own estimate of the costs of their policy proposals (as proposed in their FY2010 budget). 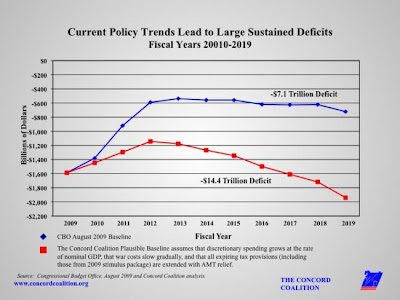 $7 trillion ($7.137 trillion) is the Congressional Budget Office’s 10-year deficit projection based on their economic forecast and policies already in place in current law. If you start with CBO’s more pessimistic baseline budget outlook of $7 trillion in deficits (by the way, the equivalent pre-policy baseline estimated by the Administration is $6.259 trillion), then add in the CBO-estimated cost of policies that have a good chance of coming true in the future (but aren’t yet written into law), you can come up with a projection that is perhaps more “plausible” than both the Administration’s (optimistic) $9 trillion and CBO’s (naive baseline-constrained) $7 trillion. That’s what we at Concord try to do when we come up with our “Concord Plausible Baseline,” which based on today’s CBO report shows that current policy would lead to $14.4 trillion in deficits over the next 10 years.